Research Journal of Nervous System is an international open access peer reviewed that publication encourages the latest research advancements in the field of Nervous System. 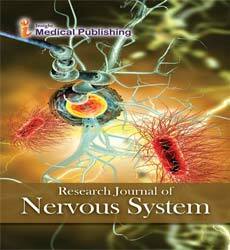 The journal publishes the latest research on Peripheral Nervous System, Nervous Impulse, Spinal Cord, Cerebral hemisphere, Hypothalamus, Brainstem, Brain Tumors, Clinical Neurophysiology, Meningiomas, Neurological Surgery, Neurology, Neurosurgery, Neurosonography, Parkinsonism, Cranial Nerves, Cerebrovascular Disease, Vascular Dementia, Cognitive Behavioral Therapy, Cognitive Psychology and Neuroregeneration. The editorial manager system facilitates a user friendly article submission, review and publication. Manuscripts that are thoroughly peer reviewed would ensure the best standards in the industry. The goal of this journal is to provide a platform for scientists and academicians all over the world to promote, share, and discuss various new issues and developments in different areas of Nervous System Research. The articles will be managed electronically, examined by a scientific committee and anonymous evaluators and published every month in HTML and PDF formats. The journal aims to serve its readers as an authoritatative resource that provides forum for Nervous system and Psychology related scientific information. It publishes high quality reserach and information relevant to Neuroscience and Psychology departments. Neuroscience, also known as Neural Science, is the study of how the nervous system develops, its structure, and what it does. Neuroscientists focus on the brain and its impact on behavior and cognitive functions. The parasympathetic nervous system is one of the three divisions of the autonomic nervous system. Nervous tissue or nerve tissue is the main tissue component of the two parts of the nervous system. Homeostasis is the property of a system within the body of an organism in which a variable, such as the concentration of a substance in solution, is actively regulated to remain very nearly constant. The Sympathetic Nervous System is one of the three divisions of the autonomic nervous system.Its primary process is to stimulate the body's fight-or-flight- response. Neural network is a series of interconnected neurons whose activation defines a recognizable linear pathway. Peripheral Nervous System is one of the two parts of the Nervous System. The PNS consists of the nerves and ganglia outside of the brain and spinal cord. The spinal cord is a long, thin, tubular bundle of nervous tissue and support cells that extends from the medulla oblongata in the brainstem to the lumbarregion of the vertebral column.